The head of China’s top court urged courts around the country to work resolutely to break judgment enforcement bottlenecks at a meeting on April 3. 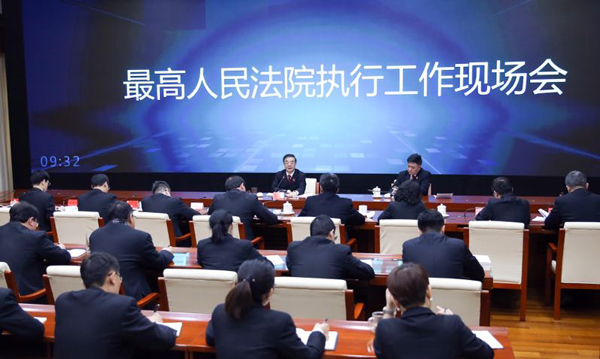 Zhou Qiang, chief justice and president of the Supreme People's Court (SPC), made the remarks at the judgment enforcement command center of the SPC. Zhou said courts of various levels in China have achieved great progress in the special initiative to “basically solve the difficulty in enforcement within two to three years”. He said people’s satisfaction and sense of gain keep growing. Judicial credibility also keeps rising, said Zhou after listening to special reports delivered by court representatives. He said information-based means must be applied to monitor timely and comprehensive progress for targeted and efficient results. The judgment enforcement command center of the SPC should monitor courts around the country in a dynamic way and in real-time, according to Zhou. Supervision and inspection must be strengthened, and punishment of slack or poor performance will also be enhanced, he added.